KKing David July 18, 2018 Whoa! I got this one right. 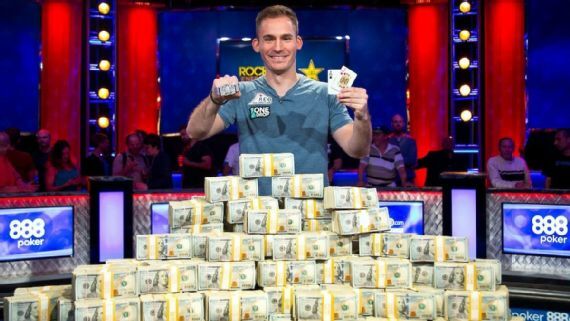 Sklansky bucks: Built on David Sklansky’s Fundamental Theorem of Poker, this is the theoretical amount of money you win in a poker pot based your equity at the point of an all-in bet and call that occurs before the river. It’s your expected value, or EV. Mostly of the time, whoever is behind still has outs to improve. If the play is +EV (after knowing the villain’s exact hand), you earn Sklansky bucks; if it is -EV, you lose Sklansky bucks. In the long run, theoretical Sklansky bucks will converge with actual money won or lost on these hands. G-bucks: Named after Phil Galfond, similar to Sklansky bucks, but taken one step further. Instead of measuring the EV of your exact two cards against the villain’s exact two cards, G-bucks measures the EV of your range against the villains exact two cards. If you would move all-in with AA, or KK, or QQ, and the villain has AK, you calculate the equity of his hand against your range. In a Sklansky bucks calculation, your EV is much higher if you have exactly AA than with QQ. In a G-bucks calculation, you are more likely to have QQ because the villain’s hand removes one A and one K from your potential combinations and you calculate the EV based on the entire range that you would play the same regardless of which hand within that range you are holding. Bonomo bucks: Named by yours truly, after watching Justin Bonomo win the Big One for One Drop tournament at the WSOP last night. Justin was kind enough to offer to sell a portion of his action prior to the tournament at the poker crowd funding site YouStake. My friend “Jeff,” who is sometimes mathematically challenged, was kind enough to bring this investment opportunity to my attention. And Jeff and I both were adventurous enough to sign up. So, unlike Sklansky bucks and G-bucks, Bonomo bucks isn’t theoretical at all. It’s the actual cash won by backing Justin Bonomo this week. woot woot! Help me boost my math… Please like / post / share /retweet my poker blog on Facebook, Twitter or Instagram, or post a comment, and clicking the Follow button at the bottom of this page to be notified of all new posts. and what is this sometimes mathematically challenged stuff?